The CKT2175-20 is a 250 VDC, high-speed wiring testing system that is capable of virtually unlimited test point expansion. The system features a very stable, fault tolerant design which eliminates the periodic requirement for calibration. As a matter of fact, the precise stimulus generator and measurement instruments have no internal calibration adjustments. The solid-state, bipolar switching matrix is highly integrated and compact, and is available in numerous form-factors. This test system is ideal for interconnection testing applications where a compact switching matrix with thousands of test points must be integrated into a small area. Examples are: mechanical handlers for multi-chip module testing, back-wiring of large form boards, telecom backplane access fixtures. 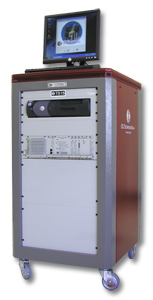 The CKT2175-20 system has identical test specifications and characteristics as the CKT2175-10. Even the Graphical User Interface (GUI) is the same, as are the test programming capabilities.